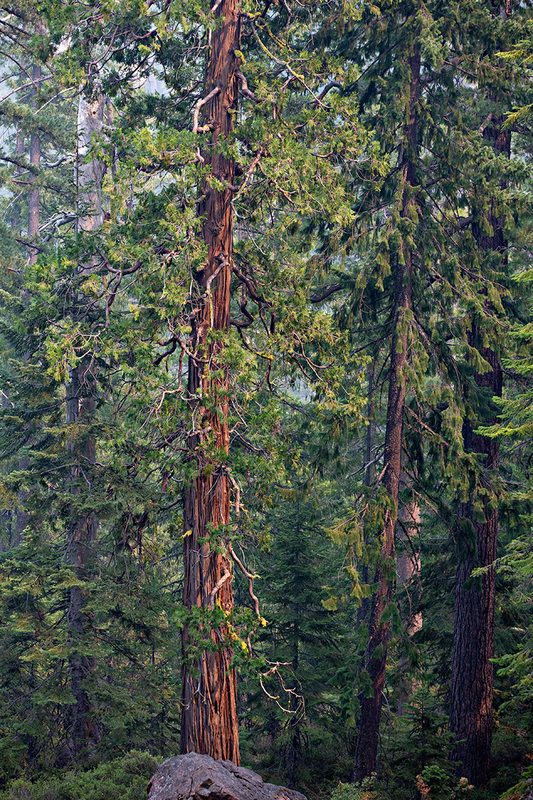 Calocedrus decurrens, or incense-cedar, has broad habitat requirements. Within its range from Oregon to Baja California, it is most often found in hot and dry sites with poor soils. 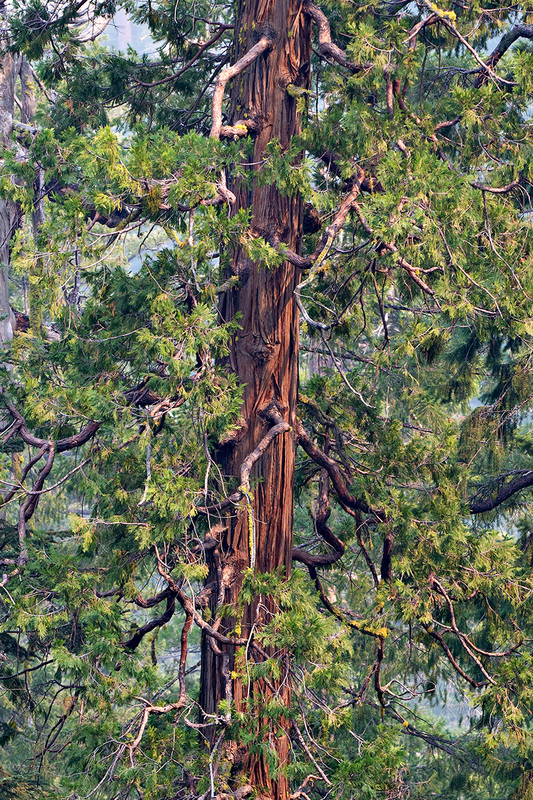 However, the tallest individuals typically occur in “sunny, well-watered sites such as riparian areas in canyons or near subalpine lakeshores“. In mixed conifer forest with Pinus jeffreyi, Pinus ponderosa, Pinus lambertiana, Pinus monticola, Abies concolor, Abies grandis, Abies magnifica, and Pseudotsuga menziesii, locally with Sequoiadendron giganteum, Chamaecyparis lawsoniana, Tsuga heterophylla or Thuja plicata, and in drier southern sites with Pinus coulteri and Pseudotsuga macrocarpa. That noted, this photograph was taken near one of the few sites where near-pure stands are known, Red Buttes Wilderness‘s Cedar Basin. For those curious about the lighting in today’s photograph (and the close-up crop of the image), this was taken on a smoke-filled day in late August of 2017. The nearest wildfires were within miles as the crow flies; in fact, we had to use an alternative route to access this area due to road closures. Fortunately, we had the experienced author and naturalist Michael Kauffmann as our guide. 2 specimens of this species from seed collected in Shasta Co., CA, have been reliably winter hardy in the Holden Arboretum (ne OH) in Zone 5 since they were planted in 1995, reaching heights of 25 and 30 feet after 20 years. They have experienced winter lows of -18º F without injury. There’s also one in the Halifax Public Gardens. It’s in a spot that’s far too shady & dry so it’s not the best specimen. Nevertheless I have never seen it damaged in our Zone 6b winters despite the wild temperature swings and the record cold (one night to -13F) year of 1994. I’ve seen some extraordinary and very narrow fastgiate forms in the Portland, Oregon area but alas they failed to root. My neighbor down the street outside of Scappoose, Oregon has several along the street frontage of their property that have fleck gold varigation, to great effect. There are specimens in the University of Idaho’s Shattuck Arboretum that were planted in the early 1900’s ( I would have a better date if I were in my office) that survived the winter of 1968 when temps were -48 F for three nights. The trees have produced several naturalized seedlings of various ages/sizes. Beautiful photographs of an interesting subject, Daniel. Thank you for explaining about the light – once you mentioned the smoke I recognized that characteristic blue haze in the background and the softer, warmer light in the foreground. Thanks for all the comments regarding hardiness. I suspected that would be the case (that it is hardier than what is published on some sites). It is curious to me that the species doesn’t have a larger range, given its wide ecological envelope. Many older people describe the smell as that of pencil shavings, but it’s really the shavings that smell of incense cedar. Evidently, the majority of pencils manufactured in the US were once made from the wood of C. decurrens. Most pencils sold now are imported from China and are made from tropical hardwoods. The compounds that make up the complex fragrance of C. decurrens are primarily chemical compounds known as terpenes. These aromatic compounds are common in conifers and serve multiple functions in the tissues, including acting as animal-feeding deterrents, insecticides and antimicrobial agents. Conifer resin is primarily composed of terpenes (from which turpentine gets its distinctive smell). Incense cedar chips and even entire chests have been used to discourage moths around clothing and other fabric items. Carvacrol, which smells of oregano and is an effective larvacide, is one of the terpenes abundant in Calocedrus. Extracts of these trees have been shown to have antifungal and antibiotic properties and there is anecdotal evidence that chips also dissuade slugs and snails. The number of actual compounds involved in producing the particular aroma of incense cedar is probably considerable. Characterizing the smell is difficult, as the aroma shifts with temperature and tissue breakdown, and fragrance descriptions are notoriously subjective. For what it’s worth, I smell elements of both overripe and under-ripe banana, candied fruit, and parsley when I smell the fresh foliage. In the wild, incense cedar is found alongside a number of other highly aromatic summer-drought-adapted plants, including sugar pine (Pinus lambertiana), Douglas fir (Pseudotsuga menziesii) California red fir (Abies magnifica) and Sierra redwood (Sequoiadendron giganteum). Such habitats are remarkable, not least because of the sheer size and magnificence of each of these species, but also because of the layering and mixing of different fragrances emanating from these aromatic trees. Comparatively near Vancouver B.C. in northwest WA state there is a spontaneous pure grove of incense cedar on a west-facing rock covered embankment immediately east of and above Interstate 5, near what I think of as downtown Mount Vernon. (For anybody that knows where the Skagit Valley Food Co-op is, the trees are visible from the northeast part of their parking area). Larger, presumably intentionally planted examples are present on the property immediately behind the slope. And are also presumably the seed source for the grove. This same combination of “naturalized” incense cedars in dry sunny areas near plantings of them is reported by A. L. Jacobson in his 2008 book Wild Plants of Greater Seattle – Second Edition for locations there. The Halifax tree was likely planted in the 1920-1940s.